Aiseesoft MP4 Converter Suite is an optimal combination of Video Converter Ultimate and DVD Creator. You can make full use of it to rip any homemade DVD disc and convert popular video/audio files to MP4 video and any other video/audio formats, including 3GP, 3G2, AVI, DivX, FLV, H.264, H.264 AVI, H.264/MPEG-4 AVC, M4V, MOV, WMV, MPEG-1, MPEG-2, MPEG-4, XviD, HD video and AAC, AU, AC3, AIFF, AMR, FLAC, M4A, MKA, MP2, MP3, OGG, WAV, WMA audio. Moreover, it will bring you much faster converting speed with AMD APP and NVIDIA CUDA technology. You are able to rip homemade DVD to MP4 format, and converting MP4 to any popular video format like AVI, MKV, WebM, SWF, MPEG, FLV etc. is also permitted by this MP4 Converter software. The Video Converter Ultimate also allows you to download video from online such as Vimeo, Yahoo and other video sites. The "Trim" function can help you cut a clip from the original video. You can set the "Start Time" and "End Time" of the clip you want to get or just drag the slide bar to the accurate position to achieve it. To remove black edge of your movie and get any playing area of the video by using its "Crop" function. It provides an easy way to combine and join multiple videos together. Then you can get a single MP4 video after the conversion. 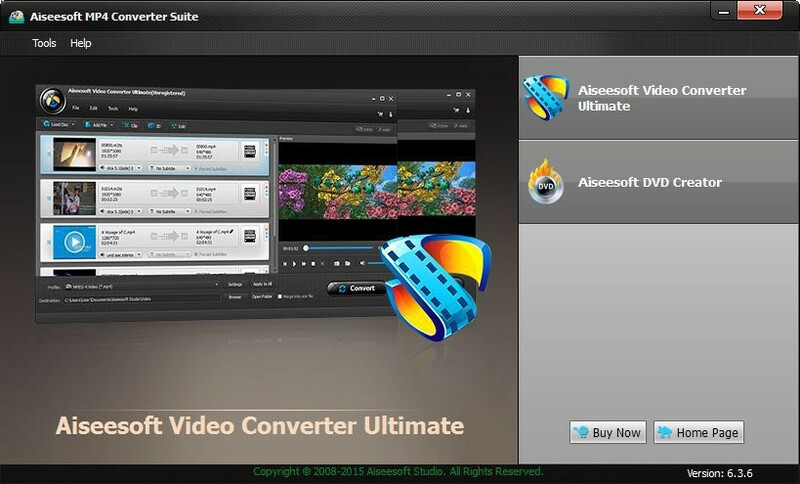 Aiseesoft MP4 Converter Suite allows users to preview the original video effect. If you like the current image in the video you can use the "Snapshot" option to save it. The part of DVD Creator can help you convert any video such as AVI, MP4, MPEG, and WMV to DVD disc/folder/iSO files. Moreover, you can customize the menu to make your video more creative. Aiseesoft MP4 Converter Suite is very easy to use. Only few clicks can complete the video to MP4 conversion. 2016-06-16 6.3.10 Support the latest device such as iPhone 6s/6s Plus, iPad mini 3/2 and iPad Air 2, etc.